Rebecca Davila and her family live in a housing authority apartment. With her, from left, are Genesis, 11 (with their dog Woody); Luis, 13; and Priscilla, 7. Luis has asthma. Getting the vermin out of ­Boston’s public housing may have improved living conditions in more ways than one: With the move has come a sharp drop in asthma symptoms among residents. Boston health officials say new city data indicate that asthma incidences have dropped nearly by half since 2005. That is when the housing authority teamed up with the Boston Public Health Commission to reduce the number of roaches and rodents, while reducing the use of pesticides, which, along with roach and rodent droppings, can aggravate asthma symptoms. The data, covering 2006 through 2010, the latest year available, show the rate of adults who reported having asthma symptoms in the authority’s units dropped from 23.6 percent in 2006 to 13 percent in 2010, the latest year available. 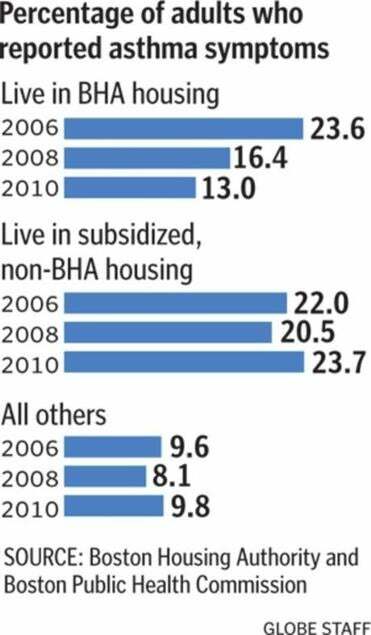 At the same time, asthma rates in other low-income housing in ­Boston not run by the authority remained relatively unchanged. In the late 1990s and early 2000s, health authorities had found extremely high infestations of roaches and rodents in housing authority buildings, and equally concerning, housing leaders were seeing desperate residents resorting to the use of powerful pesticides to try to rid their apartments of the pests. “When we started these ­efforts, people would talk about not being able to sleep at night, because of [rodents] running around or not inviting people over because of embarrassment,” said Margaret Reid, ­director of the Division of Healthy Homes and Community Supports at the Boston ­Public Health Commission. Many residents tried to solve the problems on their own. “We would have residents go and buy those roach bombs and set them off in their units, and if you have a gas stove and you set it off, you can cause an explosion,” said Lydia Agro, housing authority spokeswoman. During this time, a growing body of research was finding potential links between roach and rodent infestations and asthma. Boston health officials knew that asthma rates were increasing in the city’s public housing and decided to focus on a plan that would target the pests and the overuse of pesticides. In 2005, housing authority and health officials launched a new approach to dealing with vermin, called Integrated Pest Management. “It’s a way of reducing or eliminating pest infestation and preventing new infestations by making the environment less attractive to pests,” Reid said. Instead of having contractors come in to place pesticides after a problem is discovered, the new approach is a three-pronged, continuous attack with management promptly remov­ing trash, and fixing and preventing leaks, which create friendly places for pests to live. Residents are instructed to remove clutter and trash from their homes and to promptly notify management of leaks, holes, or pests found in their apartments. New residents ­receive a brochure and view a video, both available in about eight languages, so everyone understands what is expected of them, Reid said. Contractors are required to aggressively pinpoint problem areas that need fixing. The Public Health Commission says pest-related violations have decreased since the program was launched. Commission researchers are taking a closer look at the relationship between the levels of roach and rodent infestations and a variety of health problems, including asthma, stress, and depression among the ­authority’s 27,000 residents. The study uses housing authority residents to help collect the data through interviews with their peers. 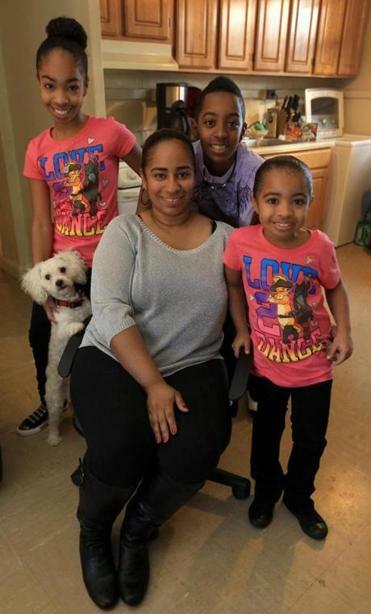 One of the surveyors is ­Rebecca Davila, a 34-year-old mother of three who has lived in Boston Housing Authority apartments all her life and was also trained as a housing advocate. Davila said that in addition to asking the survey questions, she tries to help residents understand what they must do to help reduce infestations in their apartment. Davila, whose 13-year-old son has asthma, said she understands residents’ frustrations with pest problems. “I have lived in BHA housing all my life, and if you want the BHA, or someone, to do something, you have to call; otherwise it’s not going to happen,” she said. Doug Brugge, a Tufts University School of Medicine professor who researches asthma in Boston’s neighborhoods, said that the city’s program and findings are intriguing, but that more detailed analysis needs to be done to say with certainty that the pest-control initiative is what reduced asthma rates. Brugge said other factors, such as improved health care, may have also played a role. Public health analysts studied data from a biennial telephone survey of Boston adults between 2006 and 2010. The survey asks residents a wide range of questions, and analysts compared the answers from roughly 300 housing ­authority residents to others not living in city-run housing. They accounted for factors that might skew findings, such as age, gender, ethnicity, smoking habits, health insurance, and whether respondents were foreign-­born. Foreign-born Asians, ­Hispanics, and other groups ­appear less prone to asthma, for reasons scientists do not fully understand.